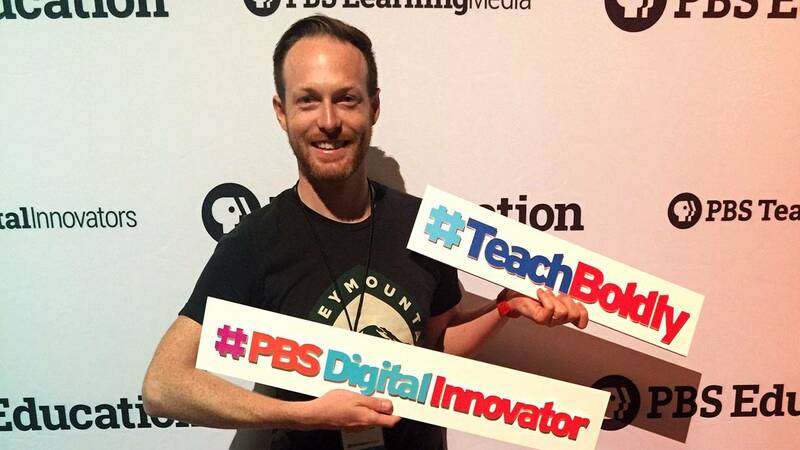 OETA is happy to announce that Brian “Jared” Morgan from Clyde Boyd Middle School in Sand Springs, OK is one of thirty educators from across the country for the first PBS Digital Innovator All-Star Program. Each of the Digital Innovator All-Stars was selected from a cohort of extraordinary educators who are doing innovative work in their schools and districts, and were previously recognized as part of the PBS Digital Innovator Program, which began in 2013. The PBS Digital Innovator All-Star program expands on this influential work, deepening these educators’ roles as leaders in integrating technology and digital media into the classroom—supporting students’ learning through increasingly important media literacy skills. Jared Morgan uses his dual degree in biochemistry and French to teach 8th grade students. His background in scientific research fuels his passion for teaching kids science through hands-on investigations, and he hopes his love for the French culture will inspire his students to explore a world beyond their own. Over the course of his five year teaching career, Jared grew to pursue another passion: infusing his teaching with technology. He was selected to represent Oklahoma as the state’s 2017 PBS Digital Innovator. “Since the onset of the Digital Innovator competition five years ago, Oklahomans have consistently placed in the top fifty of hundreds of applications to the program. Mr. Morgan has exceeded our expectations and has earned his designation as a PBS Digital Innovator All-Star. His breadth of knowledge and passion for Oklahoma’s students has developed into a creative approach being adopted by teachers throughout the state.” says Curtis Calvin, OETA Vice President of Education and Outreach. In partnership with OETA, Jared Morgan will spend the 2018-2019 school year deepening engagement among students, families, educators, schools and OETA. As an exclusive part of the program, he will have access to virtual and in-person events, including the PBS Digital Innovator All-Star Summit, to connect and learn with peers and station representatives from across the country. The PBS Digital Innovator All-Stars were chosen based on a variety of criteria, including passion for their role as an educator, outcomes from their time as PBS Digital Innovators, connections to their communities and service to under-resourced families. The full list of the 2018 PBS Digital Innovator All-Stars, their profiles and photographs can be found here.